In the 90’s, when my kids were little, they each had a big, plastic Little Tykes toy box. Both my children were a little spoiled (ok … a lot spoiled) by very generous grandparents. If I remember correctly, they had more toys than they knew what to do with. The toy boxes were always so jam packed, that the lids wouldn’t fit. I started supplementing the storage space with square laundry baskets. I noticed that they mostly played with the toys in the baskets, and not with the toys in the toy box. I finally figured out that the toy box was overwhelming for them … they couldn’t find what they were looking for without pulling everything out. Since the baskets were working pretty well, I decided to invest in some cube type shelves for each kid’s room. I also got some of those plastic milk crates. They worked well for some toys, but not for others … little pieces fell out. I liked using them for books. We ended up with a combination of mix and match baskets / bins that fit inside the cubes. Each bin was labeled with what belonged in it (Hot Wheels, Barbie’s, Legos, etc.). The cube shelves were also great for odd shaped toys … remote controlled dinosaurs and Barbie cars come to mind for me. Shared toys, like board games and art supplies were stored out in the family room. My kids had to clean their own rooms when they became school aged. Saturday mornings were usually chore days which included their bedrooms. I worked with them the first few times, until they had the hang of it. Then, several times a year, usually right before a holiday or birthday, I helped them deep clean their room. During this time, they had to choose some toys to donate to the Goodwill. They’ve always been blessed with an abundance of toys, and I think (hope) this routine gave them compassion for other kids who may have been less fortunate than they were. The benefits were two-fold: it taught them the spirit of giving and, at the same time cleared some room for the new toys that (knowing the grandparents), I knew they would be getting for the next holidays. 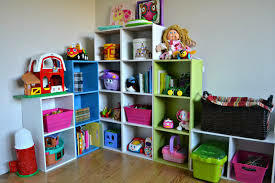 How do you organize your kid’s toys? Any good storage ideas or tips you can share?